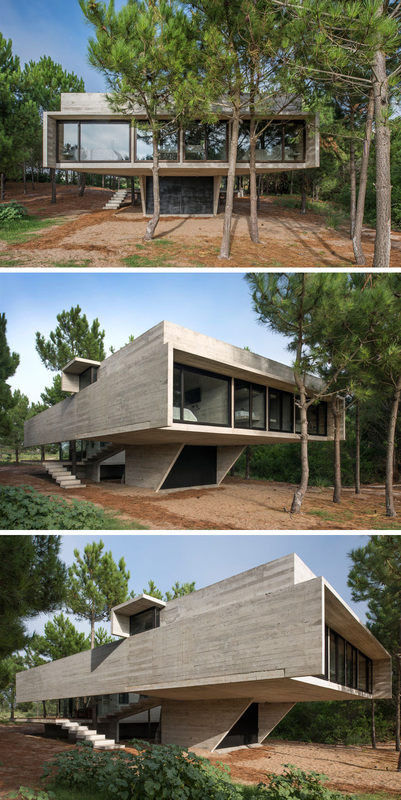 Architect Luciano Kruk has recently completed the mostly concrete S+J house in Buenos Aires, Argentina. Located within a forested area, this house was made as a vacation and rental home for two families. 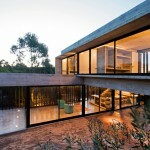 There are two levels to the home separating the social areas from the sleeping areas. 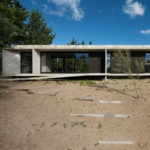 The house is made almost entirely from board formed concrete, creating lines of texture on the concrete resembling wood. 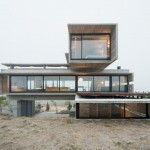 Minimalist in design, the house is tucked neatly behind the trees. 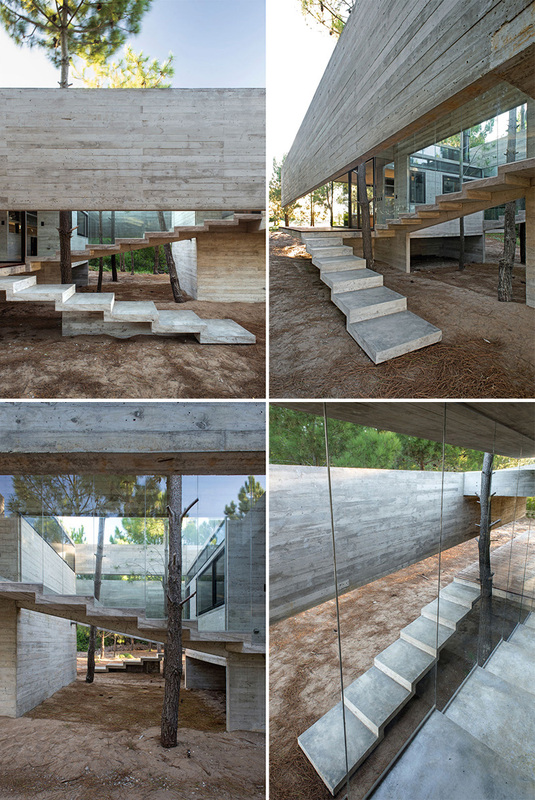 A set of simple concrete stairs leads you to the first level of the house, while a second set of stairs takes you to the upper level, home to the bedrooms. 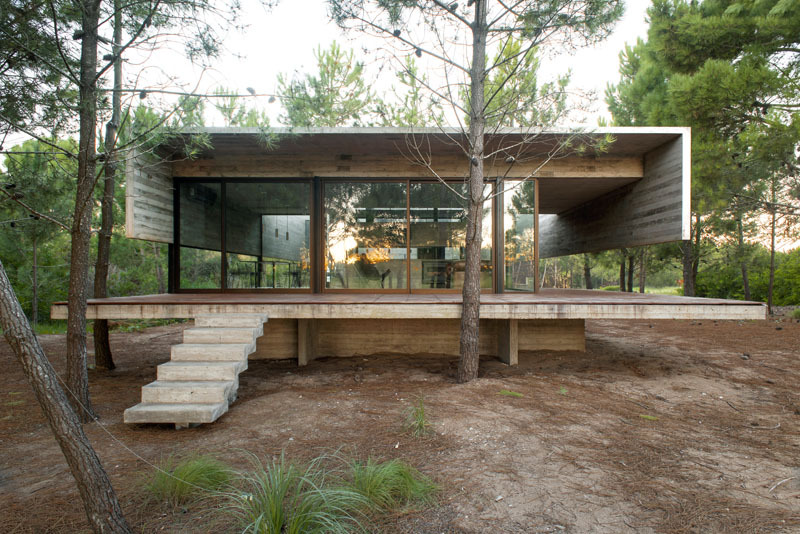 An open area between the sections of the house allows trees to grow from the centre of the home with glass windows on either side. Inside, the living room is minimally decorated with the floor-to-ceiling windows being the most important aspect in the room. A brown upholstered couch sits beside a black fireplace. 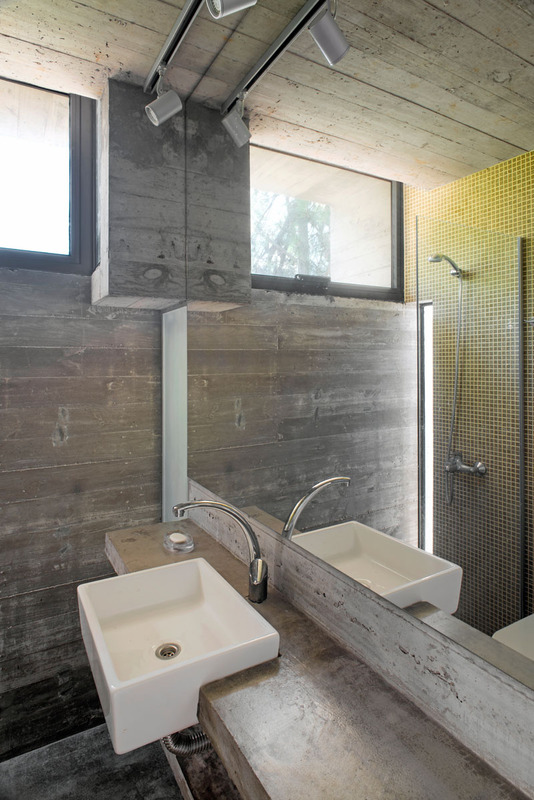 Clerestory windows allows light to bounce off the concrete walls and ceiling making the room brighter. 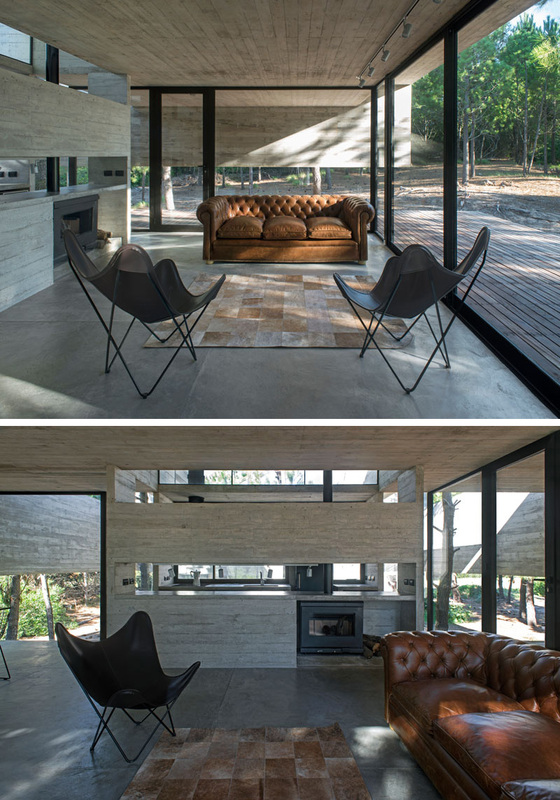 Matte black cabinetry match the black window frames throughout the house. In the dining room, three black and silver minimalist pendant lights anchor the black dining set in place. 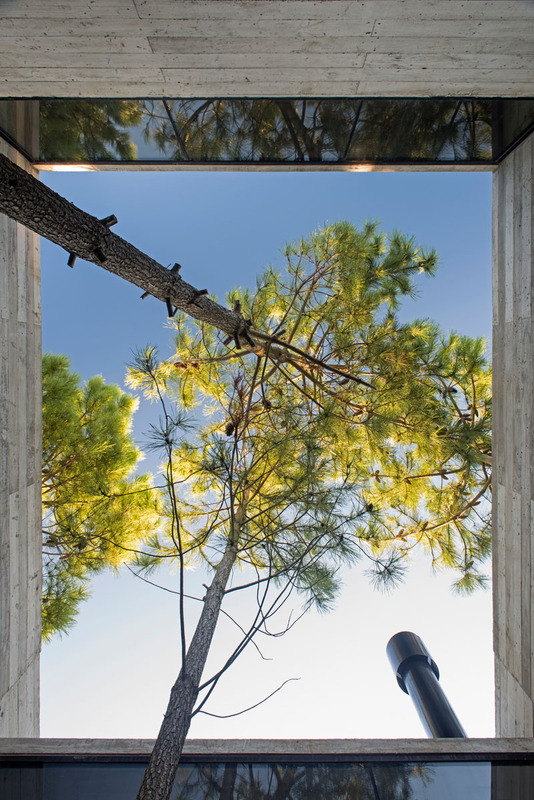 A window that travels half way up the wall gives a glimpse of the forest. Just outside the living and dining room is a small balcony that provides extra space for socializing outdoors. If you take the stairs down from the balcony and go to the side of the home, you can see into the dining area. 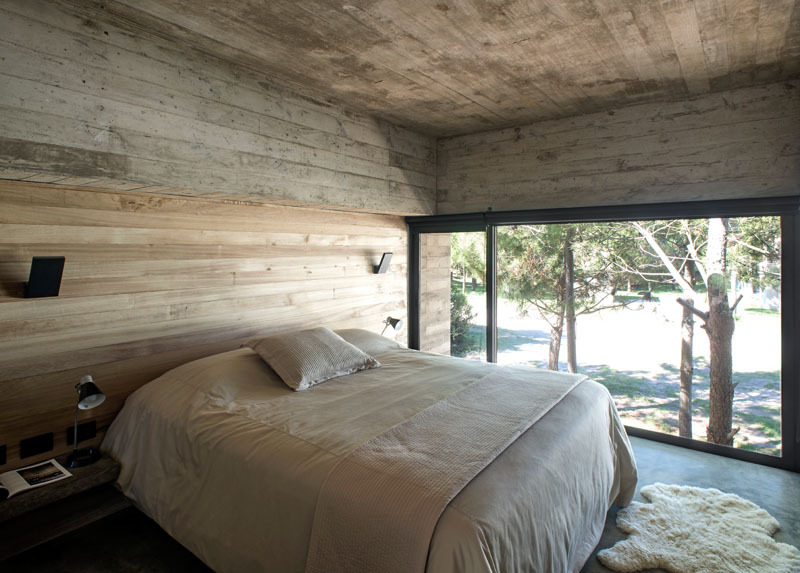 Back inside and upstairs, this minimally decorated bedroom with a partial wood accent wall, has an elevated view of outside through the large framed window. In the bathroom, a glass surround shower with lime green tiles stands opposite the rectangular white sink and large mirror.